Our cufflinks are bought by over 200 shops, associations, public schools and individuals who value quality hand crafted products. 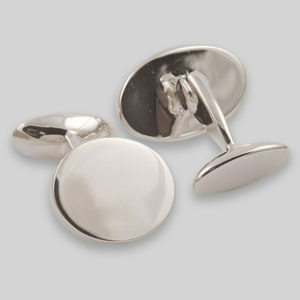 To this end, each part of the cufflink is meticulously designed to work strongly, efficiently and comfortably. Our attention to detail underlines the way we design and make our cufflinks, for example our swing back which is fitted with a stainless steel spring to allow for easy and secure fitting to your shirt cuff. Our cufflinks are designed to sit perfectly on your shirt where the cuff gathers together. This is achieved by employing a bent arm which allows the front and back plates to lie flat against the cuff. Every silver ‘T’ bar cufflink has a front plate and an arm which is squared off to sit on a stainless steel spring, which is encased into a silver back. Both the front plate and the swivel back are inlaid with matching stones, which have been sawn from the rough stone, ground to shape and then ground and polished into the settings. We use very strong cements, specially designed for the stone and metal. CK – our Orlap Studio mark. CP – Christopher Perry’s mark.